Media may submit inquiries to Scatena Daniels Communications via Ann Marie Price or Denise Scatena. SAN DIEGO, CA – Sept. 12, 2018 – With less than two weeks until opening night, organizers of the fourth annual GI Film Festival San Diego (Sept. 25-30, 2018) announce the titles nominated for this year’s awards program. 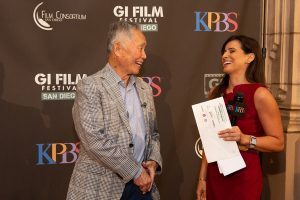 In addition to local films and filmmakers receiving honors, festival organizers will recognize national and international films and filmmakers, as GI Film Festival San Diego is the home base for the national GI Film Festival in 2018. Each film was selected through a competitive screening process and were eligible for an award nomination. The films are presented in various film blocks during the six-day military film festival. Full film descriptions, schedule and ticket information are below. The public can visit www.GIFilmFestivalSD.org to learn more, view trailers, and purchase All Access Passes and screening tickets. Category winners will be announced at the GI Film Festival San Diego’s Awards Celebration on Saturday, Sept. 29, 2018 at the DoubleTree by Hilton Hotel San Diego at Hazard Center. Some nominated films qualify for both national and local awards, as content features San Diego events, people, places, and filmmakers. Established in 2015, the GI Film Festival San Diego aims to reveal the struggles, triumphs, and experiences of service members and veterans through compelling and authentic storytelling. Documentaries, shorts, narratives, and family-friendly films are presented, highlighting stories of heroism, resilience, and honor. The festival also includes the Local Film Showcase, which features San Diego’s filmmakers, events, people, or places. Panel discussions with filmmakers, actors, and documentary subjects are also part of GIFFSD. The festival also includes a family movie night, bringing military-connected and civilian families together for an evening of movie magic and community spirit. The following films (in alphabetical order) are confirmed for the GI Film Festival San Diego this year at either the Museum of Photographic Arts in Balboa Park or UltraStar Mission Valley Cinemas at Hazard Center. Titles are subject to change. For latest film schedule with titles, visit GIFilmFestivalSD.org.